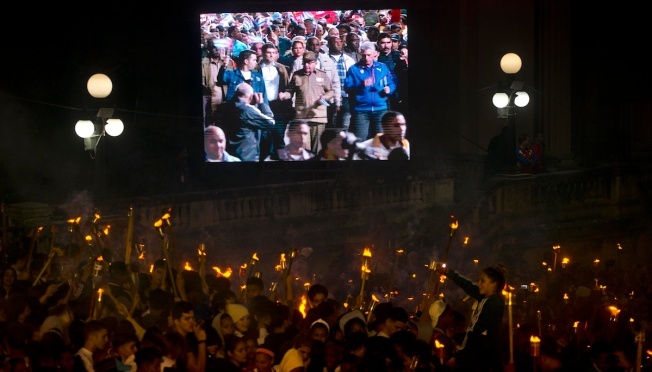 "I expect to see big changes in Cuba with the new constitution"
Cuba's President Miguel Diaz Canel, right, and Raul Castro, center, are seen in an outdoor tv screen, waving flags as they take part in a march with torches to mark the 165th anniversary of the birth of Cuba's national independence hero Jose Marti and to pay tribute to late revolutionary leader Fidel Castro, in Havana, Cuba, Monday, Jan. 28, 2019. In the midst of a regional crisis over Venezuela and tough economic straits, the Cuban government is about to launch a sweeping makeover of its centrally planned, single-party system with dozens of new laws that could reshape everything from criminal justice to the market economy. A new business law could create a formal role for small and medium-sized businesses. Until now, all private workers and employers are legally classified as "self-employed," leading to situations in which hundreds of thousands of "self-employed" waiters, cooks, maids, construction workers and janitors go to work each day for the "self-employed" owners of restaurants, bed-and-breakfasts and construction contractors.